Happy Friday! I’m so glad I snagged this lace top because it sold out quickly during the cyber spring event. I ordered size XXS regular and it has a generous fit but drapes well as seen in this clip I saved from my Instagram story. The lace they used is similar to the popular lace tee that LOFT brought back two years in a row which I own in size XSP. I love this bell sleeve top and it’s currently sold out but it’s also offered in a solid blueberry color here. I actually ordered the blueberry color but the keyhole opening in the back is very difficult to work. The loop is very tight around the button making it hard to unfasten and fasten. 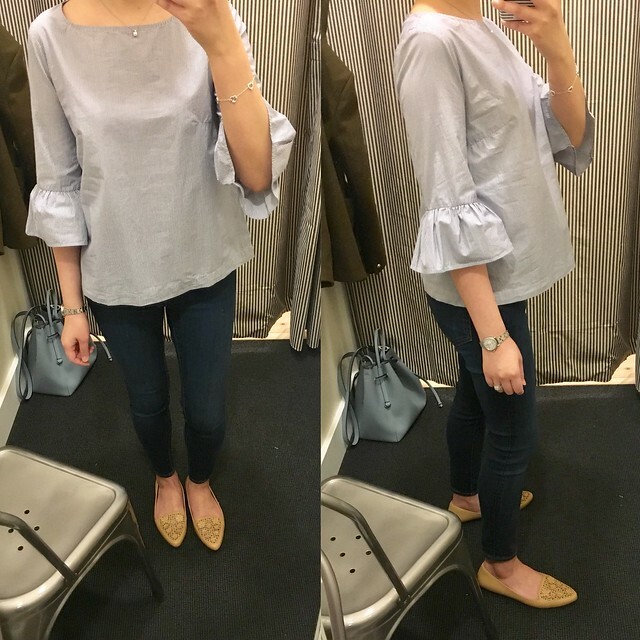 My cousin also go this top and she has the same issue with the blueberry top. She just gave up and slipped her head through the opening even though you’re more likely to get makeup around the opening of the top when you do this. I love these white skinny ankle jeabs so much that I picked up another pair recently on sale. 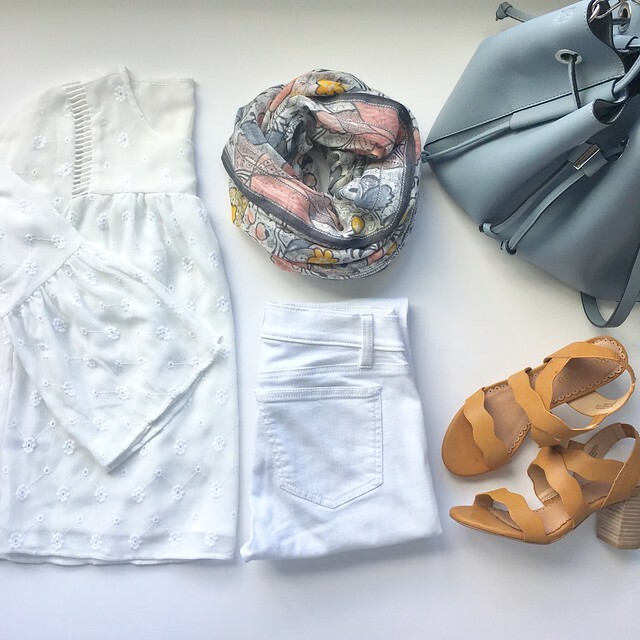 If I’m not wearing a dress in the spring and summer then I can usually be found in white jeans. Anyone who knows me knows that I love a good neutral shoe. 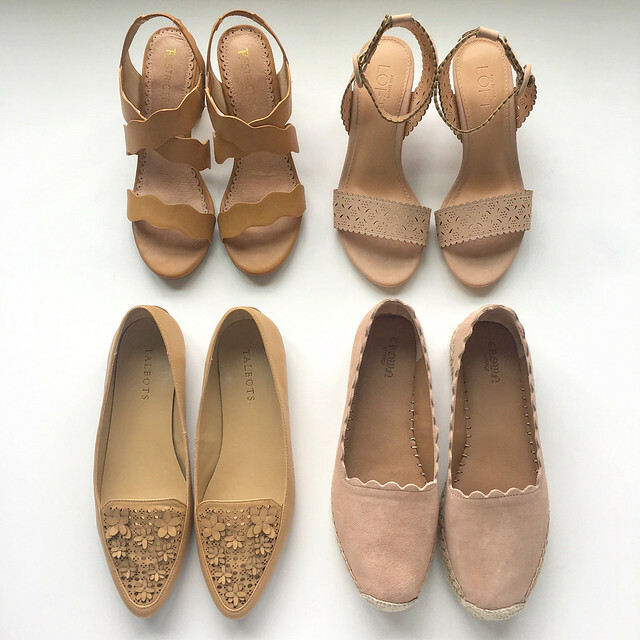 I recently added these blush espadrilles and lasercut sandals to my spring shoe line up. I’ve only worn them around the house thus far but they feel really comfortable. They do run wide and some suggest going down half a size. I fit size 6.5 but I went with my usual size 7 knowing that my feet will expand in the heat. If you have narrow feet then your heels may slip out of this shoe. 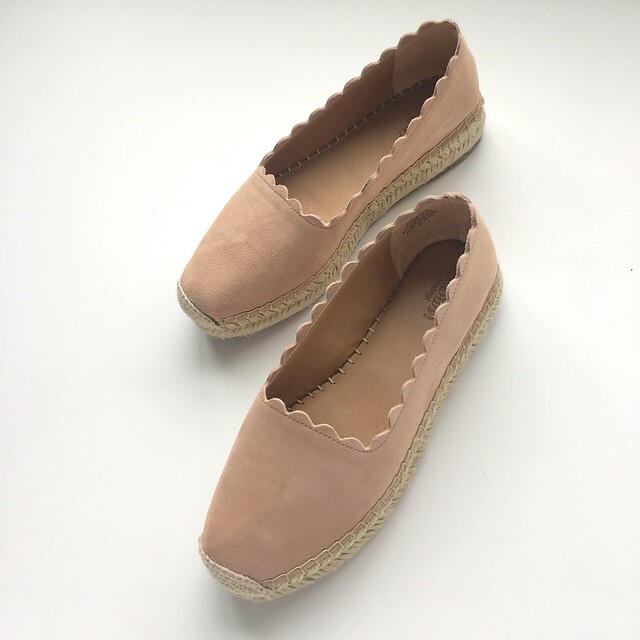 I was trying to capture the true color of these flats and they are a very neutral shade of blush that compliments my skin tone. I don’t often buy shoes from LOFT but these sandals were too cute to pass put and they will match with a lot. I took size 7 since I found that they run true to size. The heel height is a manageable 3″. 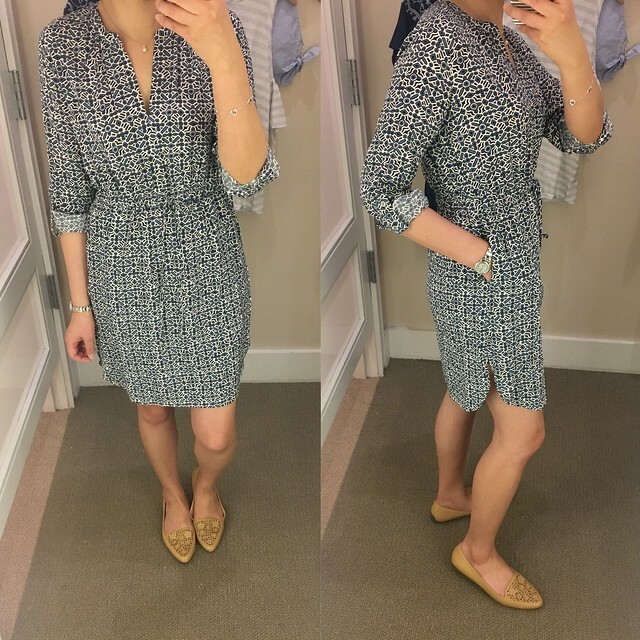 I stopped by my local Ann Taylor last week and I spotted this darling dress. The adorable sleeves caught my eye. While it wasn’t on sale, I used my $30 off $60 coupon I received in the mail as well as my Ann Cares card for an extra 25% off (LOFT is now offering LOFT Cares cards*). 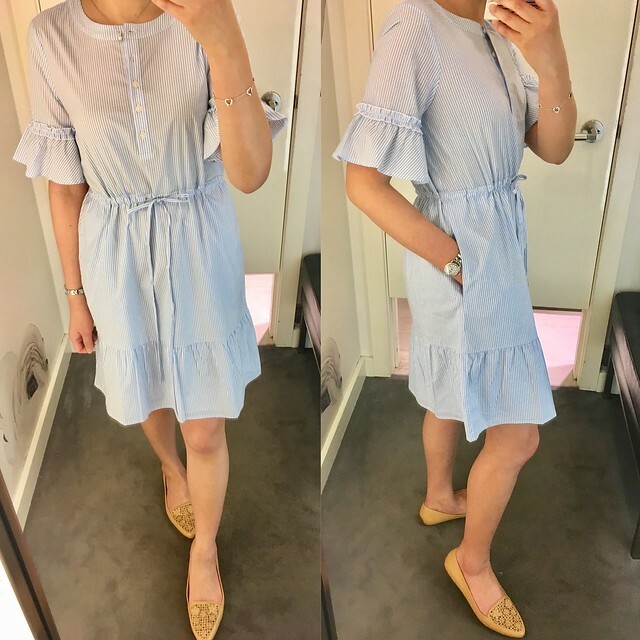 This dress looks really wide on the hanger but after you cinch the waist the fit becomes very feminine and flattering. I found that the waist runs really big and I had to cinch it a lot (I have a 27-28″ waist). I took size XXSP which fits like size XSP. Refer to this clip for another view of the fit on me. It’s also available in black. The skirt isn’t see through since it’s fully lined and I love that it has pockets. 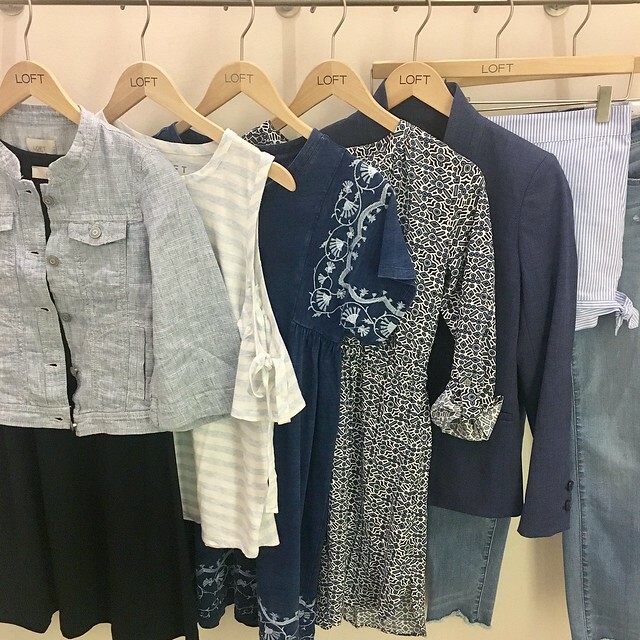 *Refer to bullet point #10 of this blog post from a former employee to learn more about shopping and saving at Ann Taylor and LOFT with the Ann Cares card/St. Judes cards. Get 40% off 3 or more full-price items and an extra 40% off sale styles at Ann Taylor. Use code MORESTYLE. Valid in stores and online. I was trying to be good and shop in store with my Ann Cares card for extra savings but size XSP popped back in the paradise blouse I’ve been stalking. 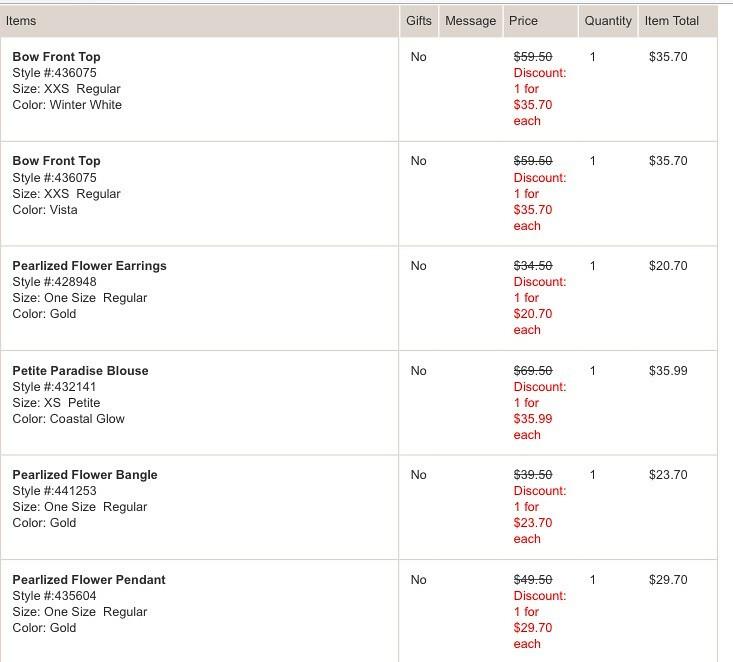 I ended up ordering a few things to try including the new bow front top since XXS is an online-only size. 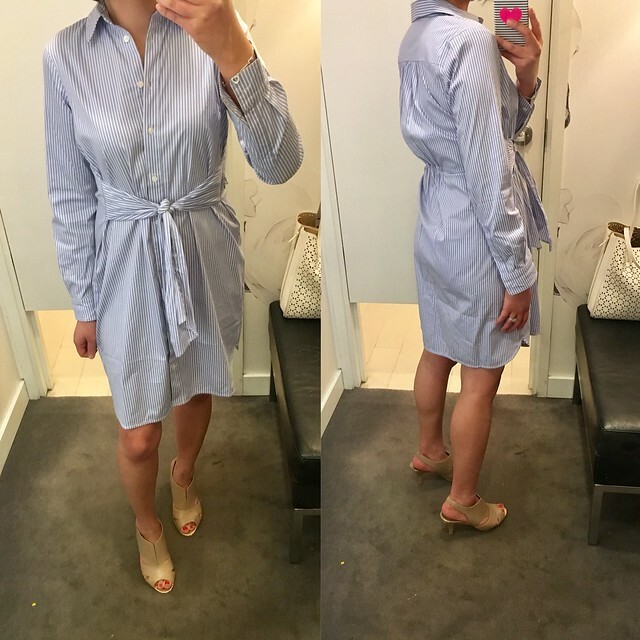 This cinch-waist shirtdress runs one size bigger. I tried on size XSP but I need it in size XXSP since the elastic waist in the back is a littler lower which makes the material in the back stick out. I saw the dress on a store employee two weeks ago and it looked really wrinkly so I ended up returning the one I ordered instead of bothering to exchange it for size XXSP. My online True Fit profile also recommended size XXSP for this dress. However, I’ll just stick to the blouse which I love (last seen here). I prefer and would recommend their newest shirtdress above. I stopped by my local LOFT last weekend as well but it’s been a tiring week so I finally hunkered down to write these reviews tonight. They were running uninteresting sales on select items all week anyway. 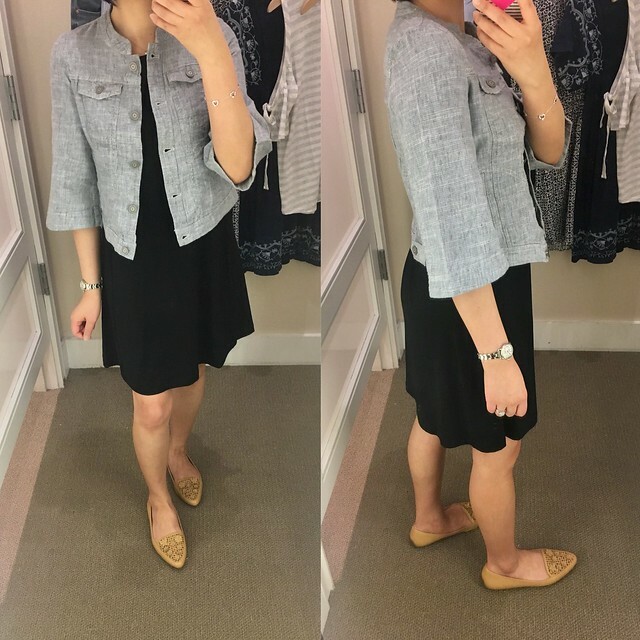 I previously reviewed this jacket in size XSP here but I couldn’t resist trying on size XXSP for size as well. Size XXSP pulled funny on me across the bust from the side view so this jacket runs true to size. My usual size XSP has a better drape and more comfortable fit across the shoulders. LOFT always brings back their basic, black swing dress and this year’s version isn’t too thin. This dress does run one size bigger so I was able to size down to size XXSP as shown above. I’ve been wanting to try this striped cold shoulder blouse for a few weeks now and I found found size XS regular to try. Unfortunately the sizing is generous (there’s a lot of extra fabric at the waist) and the length is long on me (I’m 5’2″). I definitely need this top in size XXSP or XSP but it’s been sold out for a while. I’ll continue stalking it in the hopes that my size pops back if someone returns it. It’s also available in a floral print and solid colors. 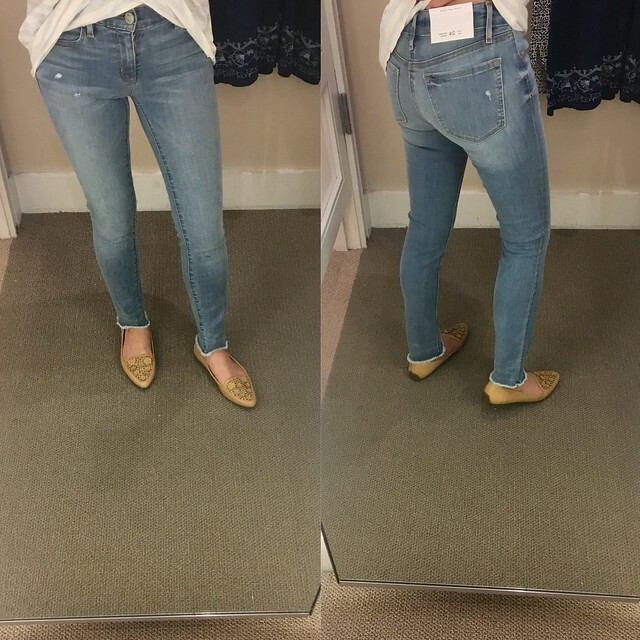 I also tried on these frayed hem jeans in size 26/2P but the 23″ inseam looks silly on me. I would need them in regular missy for the longer length. They fit true to my usual size at LOFT so I would need size 25/0 regular. To be honest, I’m not sure if I’d wear light wash jeans so I’m passing on them for now. When I grabbed this pair I thought I was trying the regular missy version of the frayed jeans I tried in petites above. Looking up the style number just now I can see that they’re different styles as noted by the slight distressing and difference in the the whiskering of this wash. These jeans also have a longer inseam so they fit like regular length on me. I would prefer this style in petites but I’m not sure that they’re offered in petites. Size 24/00 was a bit snug on me so I would need these in size 25/0 regular for a more comfortable fit. 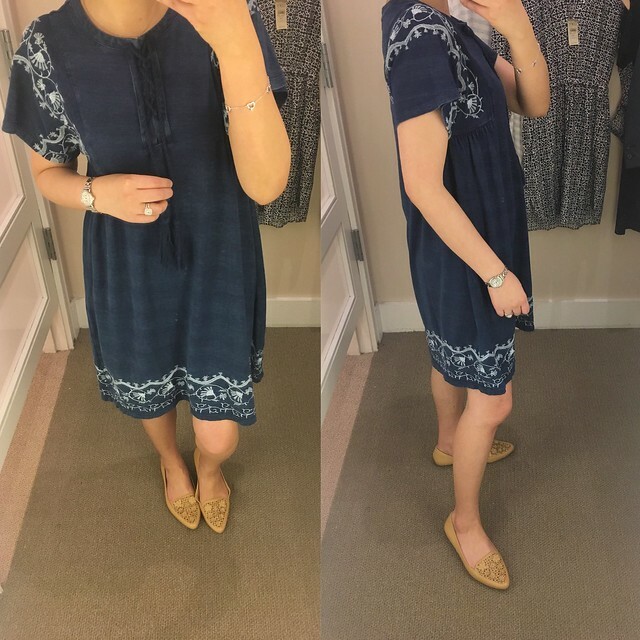 I tried on this dress since it looked so cute on my instafriend Su @allaboutloft. I love the mosaic print and the vneck isn’t too low but I didn’t like the fact that it was 100% rayon and the fact that the side slits came up so high. The slits appear easy to sew shut but they’re very short and fail the finger tip test as is. This dress fits true to size. I love a good blazer and I admittedly mixed up this blazer with another style that’s also offered in white. Size 00P fit me well and I noticed that my online True Fit profile recommended size 0 petite for me. However, LOFT blazers have wide sleeves and are cut more generous throughout the body so I sometimes like the look of sizing down for a closer fit since I have a smaller chest. Refer to this clip for another view of the fit on me. 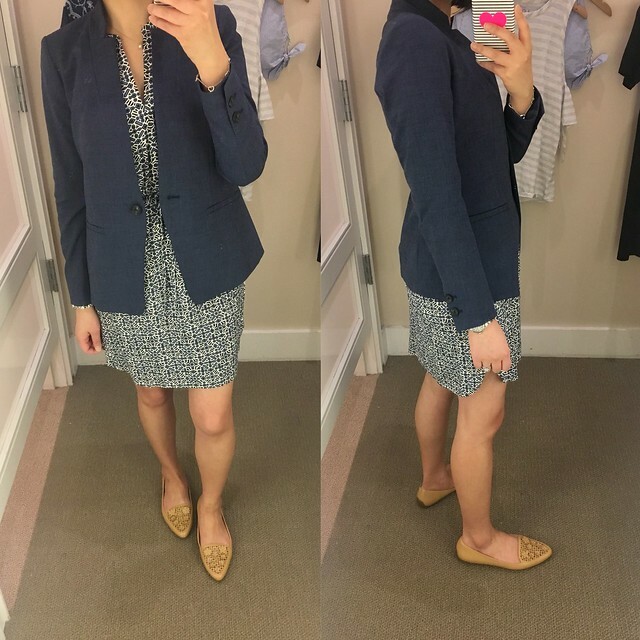 This blazer runs true to size and it has a very flattering silhouette over dresses. This dress isn’t my style but after seeing it featured on @rossmoor_styling I had to try it on for fun. It runs one size bigger so I was able to size down to XXSP. It’s really soft and comfortable and the lace up ties are so cute and on trend. I previously tried these shorts in size 0 regular and I knew I would need to try them in size 00 regular. Unfortunately I don’t have the thighs to fill out these shorts so they look like mini bloomers on me. I tried to tie the side ties tighter but it didn’t help. 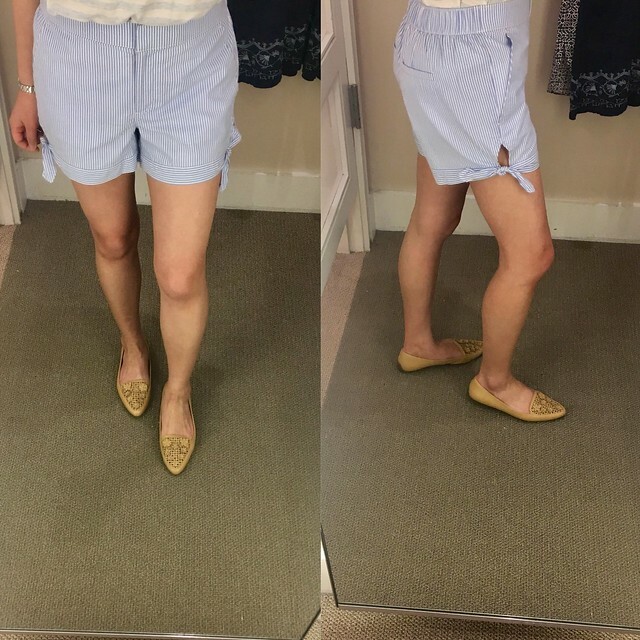 Sadly I will have to pass on these shorts but I found that they run one size bigger due to the stretchy elastic waist. 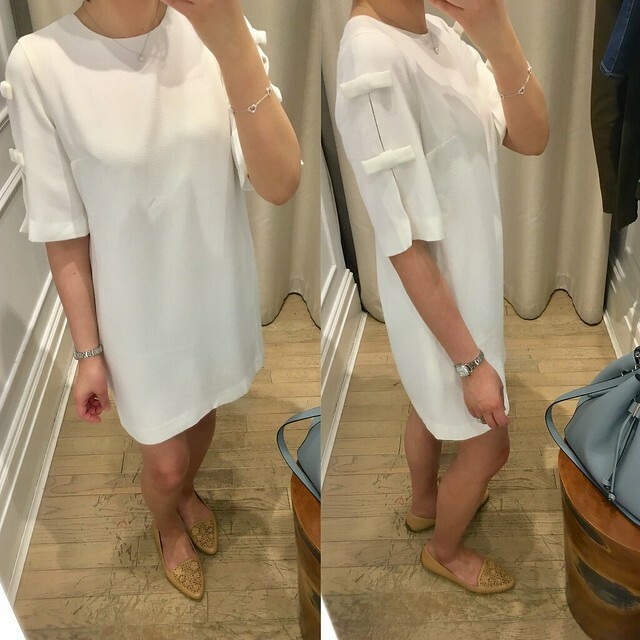 Occasionally I’ll pop into Club Monaco to check out their sale section and I came across this pretty white dress. Get an extra 30% off sale styles and free shipping on $150+ with the code FREESHIP. I don’t have any upcoming occasion to wear this dress so I left it behind (for now). It also comes in black and it’s a very minimalist dress. The length hit a few inches above my knees and I think it’s meant to be a mini dress on taller ladies. Size 00 was a loose but flattering fit on me. I love the half sleeves with the bow details since I’m self conscious about my arms. 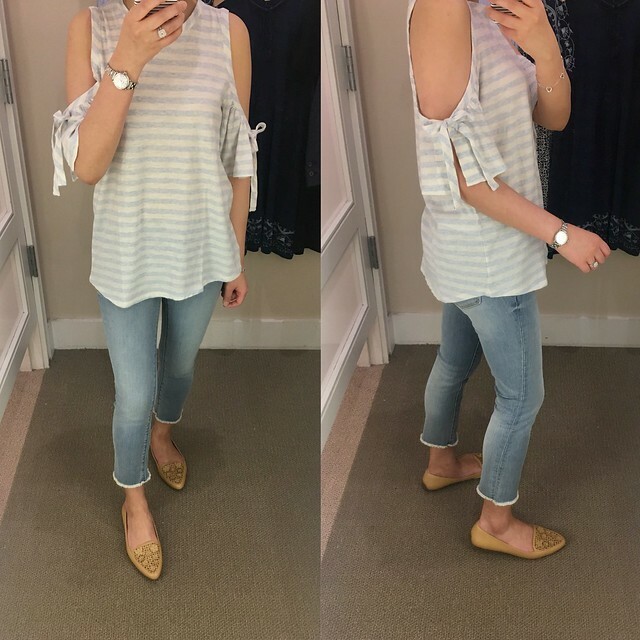 Lastly, I quickly popped into the new Madewell store in the Prudential Center but the only top that caught my eye at a quick glance was this bell sleeve top. 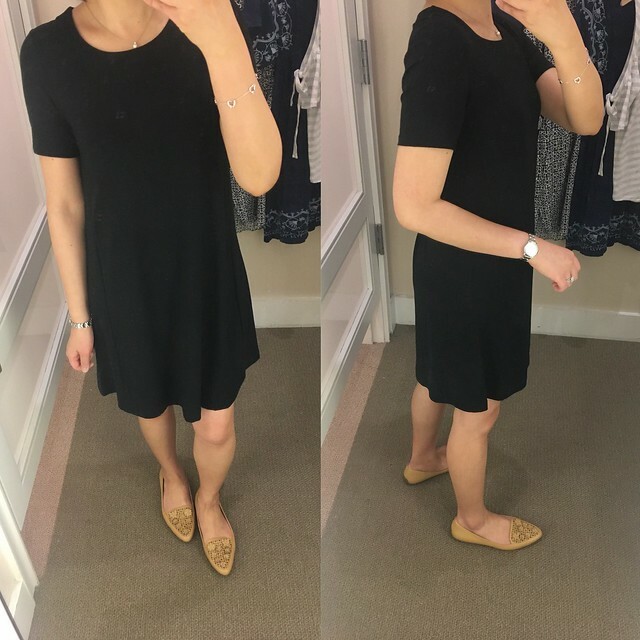 I tried on size XXS but it was snug in the upper arms (making it slightly difficult to take off) but wide/generous in the waist. Refer to this clip for another view of the fit on me. Madewell has really cute things but I’m not familiar with their fit so I’m excited to check out their stuff now that they have a store right inside my favorite mall. 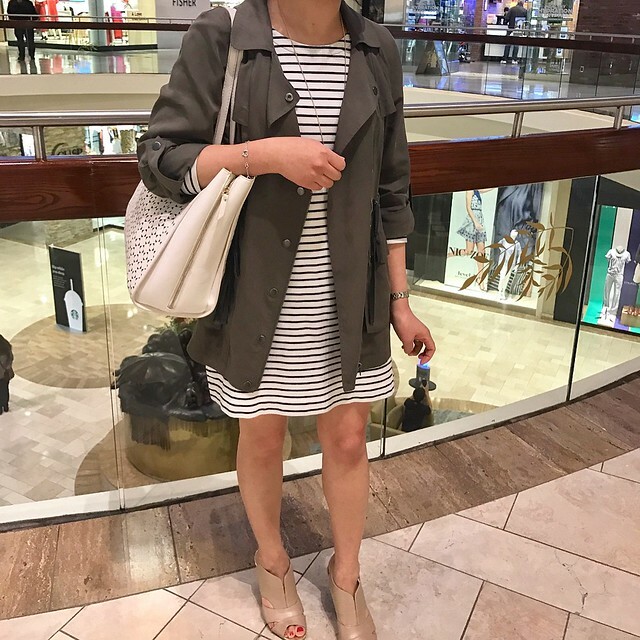 I love this striped dress from J.Crew Factory and it’s currently available in navy and white stripes and on sale for $39.50. Refer to my review and measurements here (last seen here and here).